Get Ye To The Polls! 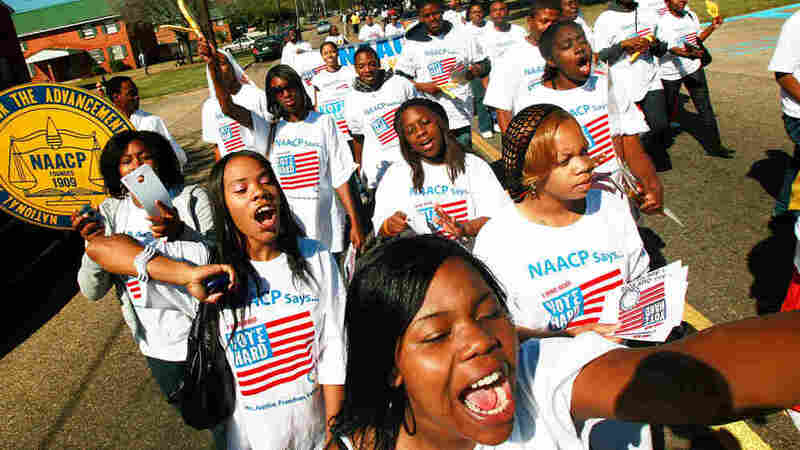 Democrats Rally Blacks To Vote As the NAACP prepares for a march in Washington, D.C., this Saturday, the Democratic National Committee is trying to persuade African-Americans who might not normally vote in midterms to go the polls in November. But young black voters say they can't relate to Congress like they could to the presidential candidates in 2008. Two years ago, college students on the NAACP's "Vote Hard" bus tour encouraged people to vote in Selma, Ala., in the presidential race. 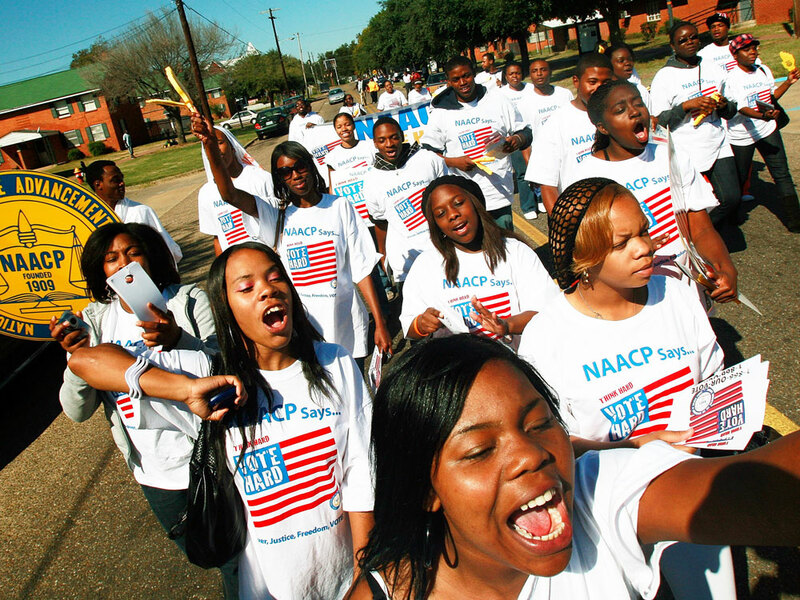 African-American voters went to the polls in droves. Now, the Democratic National Committee is trying to do the same for the midterm elections. With a month to go before the midterm elections and control of Congress at stake, Democrats are scrambling to get their voters fired up. In particular, they're reaching out to the people who were so important in getting President Obama elected two years ago: African-Americans. And they're using their most powerful motivator when it comes to black voters -- the president himself. "The last election was a changing of the guard," Obama said at a recent Congressional Black Caucus dinner. "Now we've got to guard the change." In the 2008 presidential election, more African-American voters showed up to the polls than ever before. But Democrats are concerned these same voters won't come out for this years' midterms. History shows voter turnout is significantly lower for midterms. But polls indicate the very voters who propelled Obama to the White House two years ago are not so engaged now. "Nobody votes in a nonpresidential year like it's a presidential year," says Democratic National Committee Chairman Tim Kaine. He says the challenge is to reach the 15 million people who voted for the first time in 2008. "That is a body of voters that is 35 percent African-American, is more than 20 percent Latino, is significantly under age 35," he says. To turn out these voters, the DNC is spending more than it ever has to target minority audiences in a midterm election. During the last one in 2006, the party spent about $300,000 on African-American media. This year, it has already spent $2 million on an urban ad campaign -- and more is likely. "Here is an important election in November and it is called the midterm," one radio pitch says. "Republicans are trying to take over and we have to stop them." But even with ads like this, it's not clear the message is getting through. "To be honest, I didn't even know it was midterm elections," says Amanda Oden, a 20-year-old student at Xavier University in New Orleans, a traditionally black school. She voted for the first time in 2008. "It was like, 'Oh! I get to vote!' You know, 'I'm finally old enough,' and you know, it was a black president of course. Now I just don't care. Not that I don't care, but it's not as exciting as it was before." All eight of the students in a social policy class at Xavier support Obama and give him credit for passing the health care overhaul among other things. But only one relates the president's policies to this election, and they have next to no information about the congressional and state races under way. New Orleans senior Terrinesha Williams says the outreach just isn't there: "No fliers, no e-mails, no texts, nothing." Just when I think about politics, get a mental picture — I see old white men. I'm a young black female, so it's like I have no relationship to it. It's like they make the laws and I just have to deal with it. Around campus, there aren't very many visible campaign signs. And this is a district where Democrats are hoping to win back New Orleans' congressional seat from a Republican. Right or wrong, these students think it's the candidates' jobs to find them. Michael Harvey, 21, says the Obama campaign was everywhere two years ago. "And this time, it's just not the case," he says. "I don't feel like it's us not being enthusiastic. But last time, it was brought to our front door: 'There's an election and you need to vote.' This time, I didn't even know about it." Kiera McKee, 19, says before, she connected to the celebrities, like rapper P. Diddy, to "Rock the Vote." But when it comes to who will control Congress, she just doesn't relate. "Just when I think about politics, get a mental picture -- I see old white men," she says. "I'm a young black female, so it's like I have no relationship to it. It's like they make the laws and I just have to deal with it." Xavier sociologist and pollster Silas Lee, who teaches the class, says there's a big credibility gap. "The students are saying, 'I just don't feel they're talking about me, I don't feel they care, I don't trust them,' " she says. "That is why you're going to see an enthusiasm gap." But Democrats think they can narrow that gap in the next four weeks, in part using the same groups that helped them in 2008. The buzz is under way on black talk radio. Host Michael Baisden has been telling his 5 million weekly listeners that now is not the time to go to sleep. "We have gone through hell to get this man elected!" he says. "I know you not going to sit back and let this go down. Sarah Palin? Glenn Beck? Are you serious? Are you serious?" The NAACP, unions and other civil rights organizations will be marching on the Mall in Washington on Saturday to get out the vote.